I spent last weekend doing a little ride called the Ouachita Challenge. Pronounce it 'Wash it aw', with the accent on the first syllable. This is 60 miles through the mountains of Arkansas. I would guess that around 40 miles of that is singletrack, more than just about any other mega-distance ride. I took along my fixed gear hybrid piece of junk bike. It's a Bianchi Advantage, about ten or twelve years old, with WTB drop bars and dropouts hacked to an S/S configuration. The BB is only eleven inches tall, so I have to run track-style short cranks. But it's an absolute blast to ride. 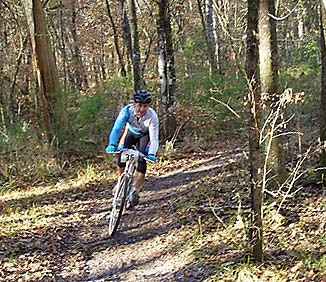 I originally decided to do the Ouachita last December after I'd visited Arkansas to ride the Womble and other trails. That was some of the most fun riding anywhere, and I wanted more. As it turned out, I was lucky to get a place. The field of 250 filled almost three months before the event. Not bad for an event with almost no advertising! As the days rolled by, I started to waffle. The weather didn't look so great, and the drive was really long (14 hours from Gainesville, with a stopover in Tallahassee on the way up). But I ended up figuring 'what the hell', got in my car, and drove. Am I ever glad I did. I arrived at race HQ in Oden, Arizona the afternoon before the event. I hooked up with a guy from Ohio to ride for a few miles. We rode up the starting climb, went on to a tougher section of trail, then turned around for a fun run back down to HQ. The course was in prime shape, and the weather was turning out excellent, if a little cold for my blood. I was stoked. I tried to go to sleep early, but made the mistake of taking a place in the bunkhouse. Don't do it! I lost count of the number of times I was got woken by snoring. I finally gave up trying to sleep at 4.45am when the next guy's alarm went off. For an 8am start. Ugh. I stared at the ceiling for another hour, then got up to chow on pancakes and coffee, finally rolling down to the start with about 15 minutes to go. There were some other singlespeeders and a bunch of people I remembered from my last visit. Most of them were pretty incredulous at seeing someone with skinnyish tires, a fixed gear, and drop bars. More than one would tell me later that they hadn't thought I would finish. I dashed off for a pre-ride pee. Of course, the race started as I was jogging back to my bike. I hopped on and spun away. The start was somewhat controlled and I was running a fairly big gear for offroad, 42:20, so I was up at the front by the time we hit dirt. We cruised up the fireroad climb and I went into the singletrack somewhere around eighth place. I figured that wouldn't last long! The first singletrack was a steady climb, so it was easy to stay with the two guys in front of me. There was some confusion at the next intersection, but I quickly realized that, if there was no-one to direct us, we were supposed to go straight. I lost time on a long downhill, but made it up at another unmarked junction. The singletrack was awesome--just like I was expecting--but then we hit a long stretch of forest road and I fell back, spinning like crazy. A steep climb brought us back onto singletrack again. I was following three guys and we yoyoed for several miles. They would get away on the fast sections, and I would catch up on the slow. A couple of guys caught up from behind and I let one pass, but the other, a S/Ser, chose to stay back. It took him a couple of miles to realize I was on a fixie. I was proud of that. About twenty miles out, we cruised into the first real aid station. I slammed a banana and soda. Another S/Ser caught us and the three of us cruised together for a while. This was a beautiful section, the trail skirting a river bluff about 200 feet up, but I was starting to lose focus. I think it was lack of sleep. The trail was narrow, and any mishap would have been disastrous, so I was nervous and over-careful. We finally got to a bit of an overlook where I pulled over to eat. By now I was so out of it that I didn't even realize the fourth guy in our train had passed me. We rode together to the next major road crossing. I had a bit more food and then one of them was gone. By my reckoning, he had sacrificed 10-15 minutes by hanging out with me. But he didn't care, he was having fun. I'm glad he enjoyed riding with the crazy fixie. The remaining S/Ser was Dean, and he stayed with me. The next section went slower until we got to the remaining sag stop. I got a turkey sandwich delivered. That hit the spot. The next section was on rolling terrain, with a single, moderate hike-a-bike and a fun switchback descent. Mmm... switchbacks on fixed gears! Then we headed up the big climb onto the Ouachita Trail, which meant a bit of hike-a-bike for everyone, and a lot of hike-a-bike for me. Shouldering the Bianchi to take a steep one I heard someone yell "Hey, Jimbo!" It was my Arkansas buddy Jayson. He had warned me about flats after scoping my skinny tires. The karma got him good. He flatted on the opening pavement. Since he'd had to wade through all the slow people on the first few miles of singletrack, he'd only just caught up. A rough section followed the last hike. Dean was hurting and dropped back--I didn't see him again until the end of the race--but I pushed ahead, thinking Jayson would catch me any second. As it was, I caught a few myself before Jayson finally passed on a long downhill. I figured I'd seen the last of the race leaders, but the course finished with 10 miles of road, the last eight of 'em paved. I just cranked up that fixie, motoring up the climbs. I passed four people, caught Jayson again, and finished a bit under 7:30. I finished 29th out of over 150 finishers. I was pretty psyched. This was one of the best-run events I've done. And at $25 it's a huge bargain among endurance events--compare it with the $170 fee for Leadville, Vail, Brian Head, CCP, and $100 for Shenandoah. Plus you get great food courtesy of the promoter's mom, and the profits go to the Hospice of Mena, a good cause if ever I heard of one. My gripes are pretty slight. Two sag stops in a tough 60 miler seems a bit sparse, especially since the toughest 20 miles comes after the last sag. And I'd have liked a memento--a T-shirt or something. The drive back was uneventful except for the fact that I drove nine hours straight without getting out of the car. Ah, the wonders of the diesel Jetta! I was happy to get back home and happy for the experience. If you get the chance, do this ride next year. Just don't sign up before I get my entry in. Jim will be trading in his beat-up Bianchi for a brand new Matt Chester Indie Rock. He realizes this means he has sold his soul to the devil, but he just can't help himself. The pictures used in the article are © Ouachita Challenge, © Tour de Felasco, and © Jim Smart's Mom. Used with permission. Our thanks to all of 'em. Check out Wade Frerich's article on racing fixed in the Heartland series.